We are very happy to do something that is highly useful to our day today life, as part of it we are focusing on a surveillance system based on a PC or laptop. We are all having at least a PC or laptop in our home, if not don’t worry, you will get a used item having a good configuration will get a low price from electronic markets. In this era of rapid changing world were crime and theft are day to day to happening around us, we should be more alert and more practical to secure are home, office or our business. If you have something’s that you want to more secure and want to observe it in the absence of you, the video surveillance is the better option to consider. You can protect your motor bikes, cars, office instruments, etc. using this technique. For this you don’t want to spend a few thousand rupees to purchase the costlier instruments and cameras. You can do it by using your own old computer and using an old webcam. Interested ? Then if you think of setting up a surveillance system but were put off by the huge expense, then these free solution is right for you to setup a nice video surveillance system with your old or new PC. To detect the movements you need a good surveillance software. There are big number of such surveillance software available on the market. But selecting the best one is the key, as the detection algorithms used in some surveillance software’s are too primitive and highly sensitive. Such faulty software will activate every time when a small living objects like rat or wind blows across the system. You can use these systems to monitor offices, buildings, retail stores,entrances, pets and your children’s rooms. The first software we want to mention is iSPy, due to it’s free and opensource availability. We don’t want spend our readers money unnecessarily, so we choose the iSpy software. If you are ready to spend more, you can check other tools explained below, which may have more options than this one. iSpy software uses your USB webcams, IP cams, capture cards, desktops and microphones to detect and record movement or sound and provides security, surveillance, monitoring and alerting services. The video is recorded directly to H264 mp4 files or AVI files. 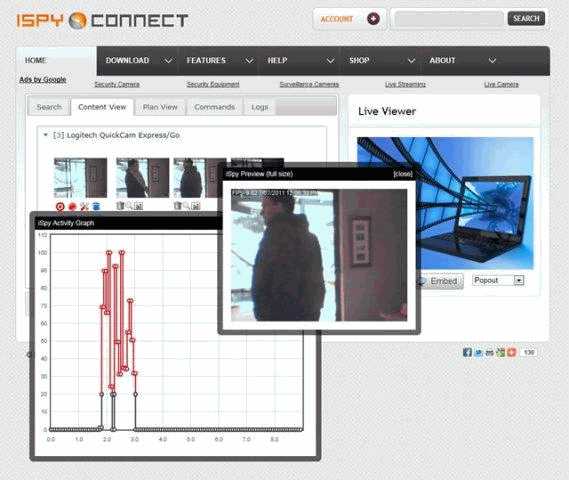 The software can stream live and recorded video over the local network, over the web using the ispyconnect portal and to mobile devices and third party software. iSpy also includes a server project that lets you connect to USB webcams and microphones running on other computers. iSpyConnect provides subscription based SMS, MMS, Email, YouTube uploads and Remote Access. LAN usage of iSpyConnect is free, but others have a nominal fess. iSpy will let you add an unlimited number of cameras and microphones, but you should keep an eye on the performance counters on the status bar of iSpy as they will tell you when you are running out of memory or CPU. The CPU can spike when recording video and encoding. If you are worried about the system resources then you can also set a maximum CPU target value in settings, by default this is set to 90%. This means that when your CPU usage goes over 90%, iSpy will start reducing the frame rates of your cameras to help protect against a crash. Once the CPU drops back below 90% iSpy will increase the frame rates again. The software currently works on Windows based PCs and is tested on Windows XP, Windows Vista and Windows 7 but may work on other Windows Variants that support the .Net Framework v4 client. Yawcam, a free web surveillance application having features like motion detection and video recording. Setting up Yawcam is pretty easy, first install the app, then select the built-in webcam for your laptop/netbook. The software can send email notification when it detects a motion. For that you do the configuration for sending the email from the software so that it sends you an e-mail whenever it detects motion. Yawcam software is written in Java and is completely free to use. EyeLine Video Surveillance Software is a feature rich video monitoring and recording software. You can record a single security camera or you can manage a 100+ camera system easily. Eyeline software is ideal for video monitoring of offices, buildings, retail stores, and as home security for monitoring property, entrances, pets and children’s rooms. You can view camera footage on site or from a remote location, that is you can monitor your home from your office or vice versa. It has an ability to use automatic motion detection on individual cameras and easily setting up of each camera is possible with just a click of a button. The recorded surveillance video can be compressed and archived. It works perfectly with both USB cameras and networked IP cameras. The software works well on Windows 7, XP, Vista, and Windows 8, the only thing you have to bother is the availability of adequate USB ports for cameras. Vitamin D is a video surveillance software that lets you set up your desktop webcam, laptop’s camera, or a network camera, into the surveillance system. This software constantly records the videos, but saves only when a relevant object is detected. It has feature which eliminates false positives. Vitamin D has some options which allows the users to specify the size of objects that will trigger events. 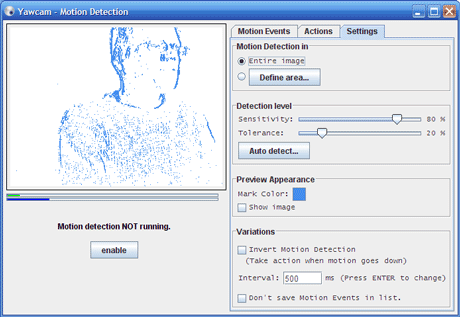 You can also set up detection windows to only monitor activity in specified areas of the video frame. The selection process can be done with a simple wizard-style interface. You can also do some specific tasks by giving a set of instructions to Vitamin D, like parking lot to be monitored for vehicles arriving, or wanting a door to be monitored for people leaving. Vitamin D Video detects people and moving objects in video, but only the single camera version is free. Webcamxp can access from PC or from mobile, it supports a large list of network cameras. Always keep an eye on your goods from anywhere by turning your computer into a security system and using other computers or your mobile phone. You can also use webcamXP to broadcast live video to your website, to schedule automatic captures or recordings or to schedule specific actions using the motion detector. We offer the largest list of supported network cameras on the market and best of all, it is free for private use with a single video source. A software for video surveillance that can manage multiple webcams and IP cameras through an easy interface. It can record it’s videos continuously or using motion detection. The software alerts can activate an email or an IP video call. Hardware recommendations for using these software vary a lot depending on the software features, how many cameras and microphones you are going to be using at any given time, etc.. A modern PC with 2GB of RAM and 200 GB of free hard disk space should be more than capable of running four cameras simultaneously at 320 x 240 resolution. Of course the better the hardware the better results you will get from software. You can refer the connecting cameras guide from iSpy is used to connect and set up cameras to your PC. Sometimes you need to apply some intelligence to work the system flawlessly. You will usually only be able to add one USB camera from a particular manufacturer. For example if you have two USB webcams from the same manufacturer only one will work at a time. This is due to limitations in the drivers provided by the manufacturers. Use USB cameras from different manufacturers – for example you could use three USB cameras simultaneously if you use one from Microsoft, one from Logitech and one from other manufacturer. All these depends on software. What you think about this technique? Can you set up a surveillance system based on this method? Share your experience, suggestions and comments here.